After two days boondocking it’s time to recharge the batteries. We moved into Marsing, Idaho to a Passport America participant on the banks of the beautiful Snake River. This camp is pretty good, and while the river is too cold to wade-fish, and too shallow to bank-fish, there is a mulberry tree with a load of purple goodness on its branches. 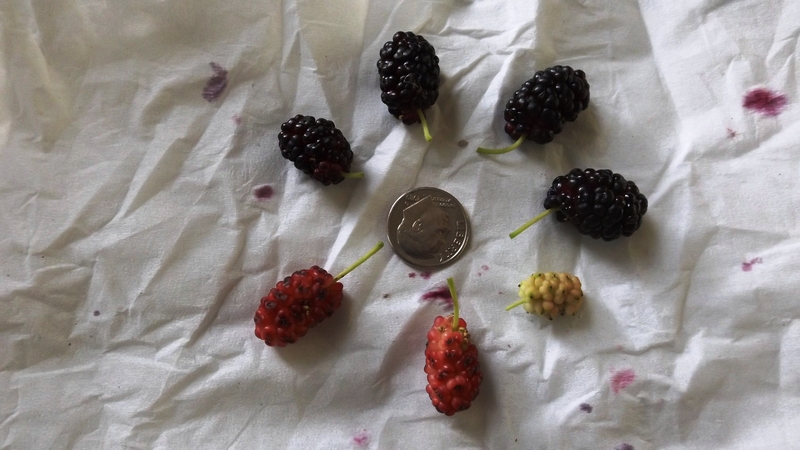 I didn’t know mulberries were edible, or grew on trees, and here we are picking them. 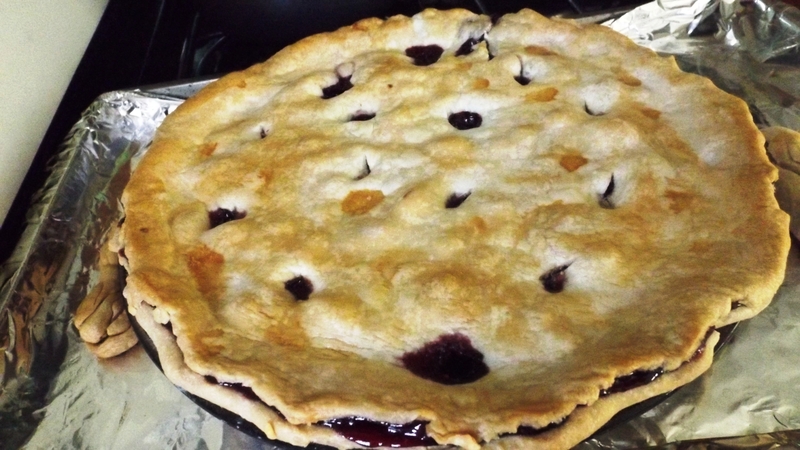 We got a good quart, which is what the internet suggests you need for a pie. They’re a very soft berry, and not really tart enough unless you pick some red ones to spice up the riper purples. The fruit also comes with a little stem that some cooks suggest you just forget about, but others want you to trim off with scissors. Our recipe was of the latter school. Kat did all the berry trimming without complaint. However, from simple observation I can assure you that, in the words of my buddy Craig the geologist, this was as delicate an operation as circumcising hummingbirds. But after she had performed the thousand brises without the support of a minyan, it was pie time. The berries look a lot like a blackberry, as do the recipes. Lemon juice is optional in blackberry recipes, but it’s required with mulberries. Vanilla ice cream is de rigueur in both. We had some pie and ice cream, and it was all too good! A quart makes a lot of pie; looks like there’ll be some for breakfast. Our neighbor here is a fellow with Florida plates who calls Golden, Colorado home, but thinks of himself as a New Yorker. He and Diane have been full-timing six years. She breeds show cats. Supposedly there are nine cats in the RV, along with three dogs. We didn’t know many people socially until we got into tennis, and Bill met his people beginning about ten years ago. That’s when, around age 65, he burst onto the karaoke scene. He’s a natural, if only with help from the finest product of the brewer’s art. In the karaoke holes he is known as “Broadway Bill”. I figured him for a classics guy, a practitioner of South Pacific, Man of La Mancha, and a born natural for Fiddler on the Roof. But that’s not Bill. He’s currently singing from The Book of Mormon. An old dog can’t learn new tricks? Bolshoi! Helllo! Just clicked on your blog from RV Sue’s – the “from New Orleans” caught my eye as I grew up in Mandeville. My husband and I are part-time full-timers – just started out a couple of months ago. Looks like we’re just a bit behind you – we’re in Wyoming right now but headed to Idaho today or tomorrow. Great blog! Thanks for the kind words, Jennifer. Hang onto your LA drivers license — south La campgrounds are a real bargain and usually freeze-safe in January. Kat and I always so pleased to hear from readers; thanks for letting us know. Oh, gosh, I haven’t had a LA driver’s license in over 20 years! I left after high school and my family moved away when I was in college, so even though I still consider Louisiana “home”, it’s been a long time since I actually lived there. We lived in Florida most recently and will probably head back that way in the fall, definitely planning a New Orleans stop on the way!